Toilet malfunctions were deemed the worst thing that could happen at a party by a survey conducted by Delta Faucet. At the same time, about 10 percent of respondents said they make sure their plumbing is working correctly before having guests over for social gatherings at their homes. "Of the more than 40 percent of homeowners who said they had a plumbing problem while entertaining, only a third knew about the problem prior to the party," said Mike Roberts, a director of product marketing at Delta. "That leaves a lot of homeowners subject to a very unpleasant, and potentially embarrassing, party incident." Chip Wade, who redesigns homes for families that have outgrown their living quarters on the Home and Garden Television show Elbow Room, mentioned that many guests in a home could strain pipes by forcing the plumbing fixtures to withstand more flushes than they normally do. 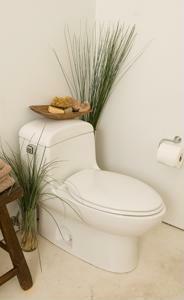 But there are other steps you can take to ensure that your bathroom is prepared to accommodate house guests. Apartment Therapy recommends stocking up on toilet paper and clean towels. It also couldn't hurt to place fresh flowers on a window ledge. A safe distance from the flowers, an unobtrusive reed diffuser or incense candle could be lit to make guests more comfortable. Meanwhile, an expert provided some bathroom cleaning advice to Oprah Winfrey's website for a report on the steps homeowners should take to be ready for company. "The bathroom is the one place your guests are going to be alone," Debra Johnson, training manager at Merry Maids, told the source. "Concentrate on the sink and the toilet - Make sure there's extra toilet paper out. You want everybody to be able to see it and have access to it." Keep in mind that sometimes it's the little things that count. For example, some people forget to take out the trash in their bathroom, as powder room trash containers tend to be smaller than trash cans placed in the kitchen. However, some guests might be grossed out if they accidently knock the trash container over, and see a pile of used tissues leftover from a cold you had three weeks ago.